Sevendust flexed their metal muscles last year when they released a top-notch set of new songs on their 12th studio album, “All I See Is War.” The Grammy-nominated Atlanta group has been touring in support of the album, and now, they’re hitting the road with Tremonti, the band spearheaded by Mark Tremonti of Alter Bridge and Creed. 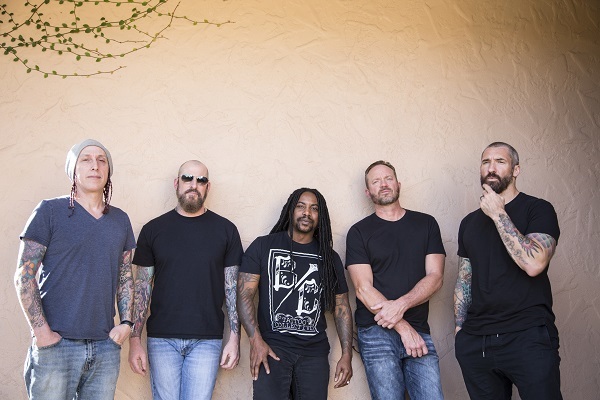 Guitarist Clint Lowery couldn’t be more grateful for fans’ positive reaction to not only the new album but Sevendust’s career as a whole. He spoke with Anne Erickson of Audio Ink about “All I See Is War,” what he most admires about Tremonti and his own plans for a solo album. Read the full interview below, and listen via the YouTube player. Anne Erickson: Congratulations on the success of “All I See Is War.” Now that the album has had some time to get out there, what’s your favorite thing about how fans have reacted to this album? Clint Lowery: After being around 20 years, we put a lot of work into these albums, so we hope people like it and understand it. The thing we really pride ourselves on is when people compare it with the old records, and there’s all this history there, and it’s cool when someone says, “This is the best you’ve ever done.” I think every artist wants to hear that their most recent work is their best work. There’s an element to it, too, where they compare a certain song to the older stuff and say, “This has the same spirit as these old records,” which is also a compliment. We don’t do a lot of them at once time— we sprinkle them in. “Dirty” is a great, fun song to play live. They are a little nerve-racking in the beginning, because people don’t know them that well, so there’s that aspect. It’s not always a great experience until people really absorb the material. But, I think “Unforgiven” is one of those songs where the record had been out a long time before we added it (to the set), and people knew what it was, and it was cool to see them singing along. Lyrically, I really had something to say on that particular song, too. You’re kicking off a major tour with Tremonti. What made you guys want to hit the road with Tremonti? We’ve known those guys for many years. I dig what Mark Tremonti does with Alter Bridge and his solo stuff, and it’s great to have them come out with us and watch them. We know everyone in the band and the crew, and they are all good people, and we’re under the same umbrella, and I think it made total sense. I think he’s going to start working on the new Alter Bridge record after that, so it’s a cool way to end his cycle. You’re a great guitarist, and so is Mark Tremonti. What do you admire about Mark and his playing? You know, what I admire about Mark, and knowing him as long as I have, on the Creed tours we did with them, he was a good guitar player, but he wasn’t the guy you look at and see when you see in Tremonti now. He wrote great songs, but he wasn’t a shredder, so he worked for that. I would watch him every day for hours practicing, and he has incredible discipline. He did the work, and he made himself into what he is now. How has touring and making music changed for you guys over the years? It’s so different now than what it was, the social media aspect, the streaming aspect, the way you make records, the cost of everything, marketing—everything is different. If hasn’t been this abrupt change, though. Everything slowly changes. Streaming, at first, was this odd thing, and now the physical, tangible product is phasing out, and it’s more of this streaming world. But, we never fight it. It is what it is. We’re not one of those bands that says, “I wish it was like the old days.” That doesn’t make sense to me. I always said to myself, “I hope I can always embrace change.” It’s hard for new bands. I hate to see new bands struggle, because there’s not a lot of support and development. That’s one thing, but outside of that, it’s going to change whether you want it to or not, so I might as well accept it. Has Sevendust started to think about a follow-up to “All I See Is War” yet? We don’t want to wait a long time. We’ll probably end up recording a new record at the end of this year, and we already have some ideas floating around for it. I’ll record a solo record in June and release it after the Sevendust cycle slows down, but we’ll definitely, probably end up tracking a record the end of this year. That’s exciting about your solo album. Will you sing on it? I’m going to sing. I’m going to play everything I can—maybe a couple of songs on drums, but I’ll have a drummer come in. But, everything else, I’ll do myself. I’m really excited. It’s been a long time coming.